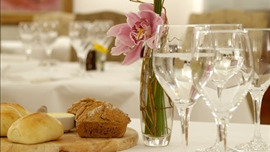 The popular Ananda Restaurant can be found on Sandyford Road in Dundrum Shopping Centre. It is a joint partnership between Asheesh Dewan, owner of the well-regarded Jaipur restaurants, and critically acclaimed chef Atul Kochhar who also owns Michelin starred Benares in Mayfair. Ananda has a modern contemporary setting with intricately-carved Indian wood panelling and smart polished wood tables set against chairs and banquettes in a variety of pretty colours, walls are adorned with colourful canvasses depicting vibrant rural scenes. Richness, intensity and concentrated flavours are the hallmarks of the menu at Ananda which picked up the Good Food Ireland Newcomer of the Year award for 2011 - 2012. Typical starters on the à la carte menu could be free-range Barbary two-ways duck tikka with passion fruit and date chutney and potted duck leg confit, plum and anise jelly, before a main course of pan-fried Howth lobster in a traditional Goan style sauce, with tamarind rice. There is an excellent wine list, carefully chosen to match the dishes with a good selection available by the glass, together with a well-crafted cocktail menu. Irish Chicken in three traditional & regional flavours – Kashmiri chilli spiced Tikka, saffron & cardamom supreme , Chennai "Special 65 spice "
Tandoori Irish chicken on the bone with Amritsar chilli, garlic & yoghurt. Wild rice, black lentil pulao & crispy onions. Free-range Irish chicken breast stuffed with wild mushroom, pistachio & fennel. Fresh berries, Raspberry sorbet & Shrikhand (cardamom flavoured strained thick Yoghurt). Safrron & sugar coated pineapple, chutney, crisp with Coconut & lime leaf sorbet. Tropical fruit sorbet, mango paper, basil flavoured Tapioca pearls.